Geology Drift over Hardraw Scar Limestone. Record Name Ivelet Bridge. 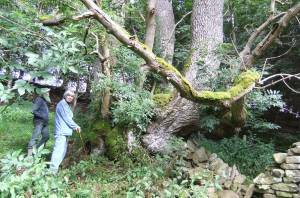 Jocelyn's ancient hedgerow ash tree, now wind- fallen. Record Description This fine relict hedgerow ash tree was the largest and probably the oldest ash tree yet recorded in Swaledale and adjacent areas before having been fragmented when the greater part of this multi-stemmed ancient laid hedgerow tree was blown down during a recent gale. This tree, which was first recognised by Mrs Jocelyn Campbell measured 9.3m girth at 1.10 above ground level. For photographs of this relict hedgerow ash tree before it was blown down see SWAAG Record 278. 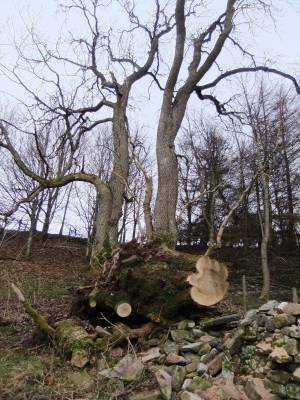 This a loss to the historic landscape of the area, since this tree was already very old when it was last cut and laid as a managed hedgerow tree. 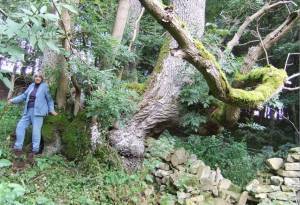 A preliminary tree ring count suggests that this tree was last laid in a hedgerow approximately 170 years ago. 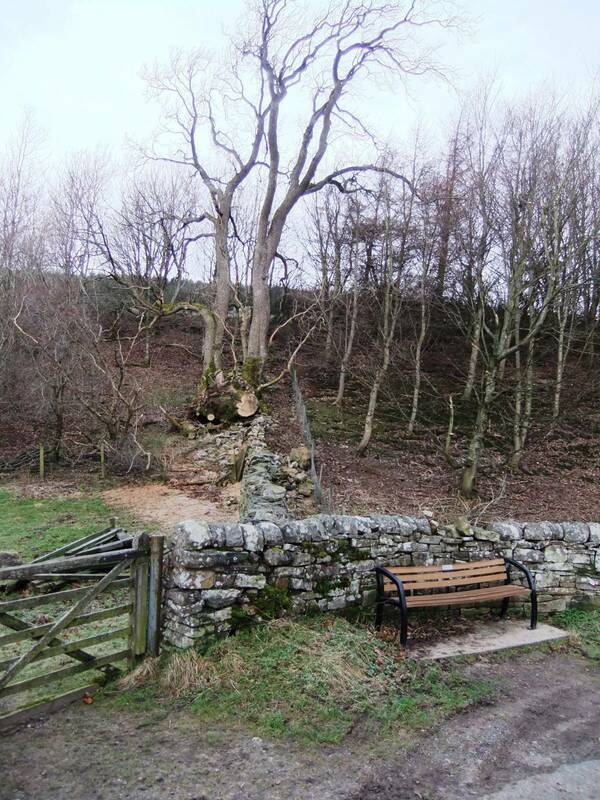 This would be before the construction of the present day dry-stone walled field walls which abut the tree. Dimensions 9.3m before fragmented and wind blown. Additional Notes The loss of this tree illustrates the necessity of making a good photographic record of all mature trees in the Dales landscape and stresses the fact that all the very old and large ash trees which hitherto have been such a feature of the Swaledale landscape are vulnerable to gales. Several mature ash trees similar to this tree are blown over and lost every year. It is to this end that the present SWAAG Tree Site and Tree Surveys are in progress. We are indeed most fortunate that Jocelyn has drawn and captured the character of this tree before it was fragmented and that she has drawn so many other fine trees in Swaledale. Image 1 Description The relict hedgerow ash tree after being blown and fragmented in a recent gale. Image 2 Description Jocelyn at the ash tree before loss of the greater part of the tree in a recent gale. Image 3 Description Jocelyn at the ash tree before loss of the greater part of the tree in a recent gale. Image 4 Description The relict hedgerow ash tree after being blown and fragmented in a recent gale.